NETWORK FINALS: BIG BROTHER and MASTERCHEF gained 0.1 in final numbers, while the SUPERNATURAL rerun lost the same. CABLE HIGHLIGHTS: After months of hype, HBO’s ANY GIVEN WEDNESDAY WITH BILL SIMMONS premiered at a tame 0.12. OWN’s GREENLEAF was down steeply from Tuesday’s 0.84 premiere, but the 2d hour of last night’s back-to-back episodes (the show’s regular timeslot) was still strong enough at 0.56 to top Wednesday cable, and the 9PM hour was very consistent at 0.53. The COPA AMERICA coverage appears to have been plagued by rain delays last night, but Univision still scored 0.54 for a late-night hour, and Fox Sports 1 was at 0.43 in primetime for Chile vs. Colombia. MTV’s THE CHALLENGE gained 0.05 to 0.51, with a lead-out special at 0.34. On HGTV, BROTHER VS BROTHER fell 0.07 to 0.44, HOUSE HUNTERS rose 0.04 to 0.44, and HOUSE HUNTERS INTL was up 0.02 to 0.35. 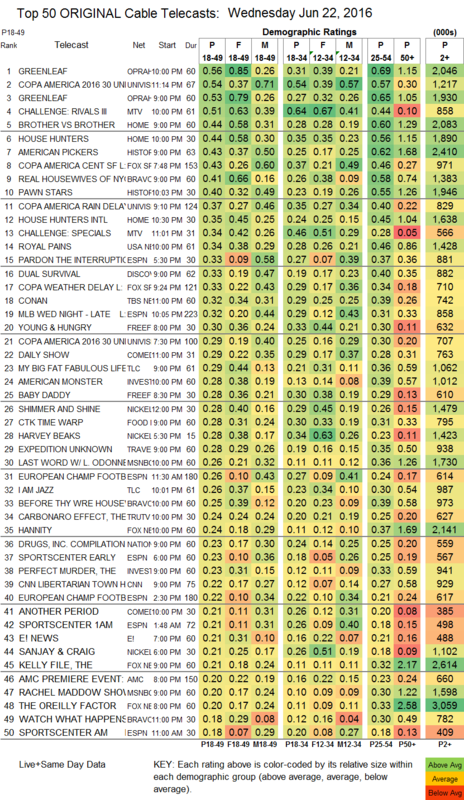 History’s AMERICAN PICKERS was steady at 0.43, and PAWN STARS lost 0.04 to 0.40. On Bravo, REAL HOUSEWIVES OF NYC dropped a tenth to 0.41, and a lead-out BEFORE THEY WERE HOUSEWIVES special was at 0.25. USA’s ROYAL PAINS climbed 0.06 to 0.34. Discovery’s DUAL SURVIVAL fell 0.05 to 0.33. 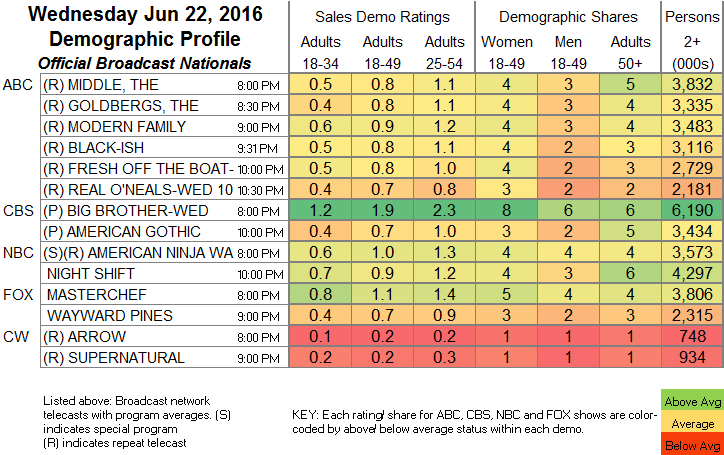 On Freeform, YOUNG & HUNGRY ticked down to 0.30, and BABY DADDY fell 0.09 to 0.28. TLC’s MY BIG FAT FABULOUS LIFE was down 0.02 to 0.29, and I AM JAZZ dropped 0.04 to 0.26. Tru’s THE CARBONARO EFFECT lost a tick to 0.24. Comedy Central’s ANOTHER PERIOD held at 0.21. On TV Land, the season finale of LOPEZ dropped 0.03 to 0.09, and the series finale of THE SOUL MAN was down a hundredth to 0.07. El Rey’s LUCHA UNDERGROUND ticked down in its first hour to 0.03/104K, and held in its second at 0.01/62K. IFC’s MARON added a hundredth to 0.05/113K. Sundance’s CLEVERMAN lost 0.02 to 0.02/123K.